Advanced Combat Helmets failed to meet ballistics testing standards, an Army official announced Monday. Washington (CNN) -- The U.S. Army is recalling 44,000 combat helmets -- some of which are being used by U.S. troops in Afghanistan and possibly Iraq -- after they failed to meet ballistics testing standards, an Army official announced Monday. Brig. Gen. Peter N. Fuller, who's responsible for buying and testing equipment for soldiers, told reporters at the Pentagon the recall was issued Thursday. Tests showed the Advanced Combat Helmet (ACH), which is standard issue for all soldiers, did not meet service requirements. Fuller said he was not aware of any injuries or deaths related to the recalled helmets. The move was triggered after the Justice Department informed the Army about an ongoing investigation into the company that makes the helmets, ArmorSource LLC, formerly Rabintex USA LLC. "There is evidence that ArmorSource and Rabintex ACHs were produced using unauthorized manufacturing practices, defective materials and improper quality procedures which could potentially reduce ballistic and fragmentation protection," said an All Army Activities message released May 14 to soldiers around the world. After the Justice Department's notification, the Army conducted ballistic tests on the helmets and found they didn't meet service standards. It is unclear why the helmets failed the most recent tests but passed initial testing when the Army first contracted with ArmorSource in 2006. The Army has an additional 55,000 helmets in storage. Those are also part of the recall and will be destroyed to ensure they are not distributed, Fuller said. The Army refused to accept delivery of another 3,000 helmets recently, bringing the total of problem helmets to 102,000, Fuller said. The helmets cost $250 each, and Fuller said the Army is investigating whether it can recover funds already paid to the company. The 44,000 recalled helmets had been sent to locations all over the world for distribution. Some 24,000 of them were sent to a distribution center that gives them to other services as well. "We don't know where they are, so they could be on a soldier's head in Iraq or Afghanistan," Fuller said. "We are seeing some getting returned in Bagram (Afghanistan)." A statement posted on the ArmorSource website says the Army has not notified the company about the recall. "ArmorSource was not informed of this recall before we saw the press release on Friday evening. We have not heard from the government regarding the recall and have no additional information," the statement said. 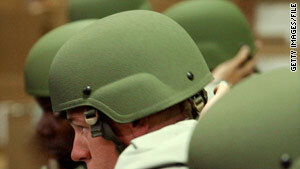 Army officials said they were not required to tell the company about the recall because the military owned the helmets. Fuller said the Army had already broken its contract with ArmorSource earlier in the year because of other problems with the helmets, including paint chipping off. Army officials could not discuss details about the problems with the helmets because of the Justice Department investigation, but they said the ballistics tests showed they would not protect a solider against a worst-case scenario strike on the helmet. Fuller said general ballistics tests showed that while a bullet would not penetrate the helmet, they still failed to meet stringent Army requirements and "fell short of the required ballistics test." Three other companies also make the helmets, and replacement helmets are already being distributed, an Army statement said. The recall affects about 4 percent of the more than 1 million ACHs in the Army's inventory, according to Army statistics.